I tried flat tracking a few months ago. I blitzed the first-timer’s field until someone pointed out that I was riding a bike with a front brake and using it. So I switched to the rear brake, went for broke on the last lap and promptly ate more dirt than a stoned earthworm with poor self-control. The bike was cactus and my left knee has only just recovered. The lesson was simple; learning to go fast on dirt can be a painful exercise. 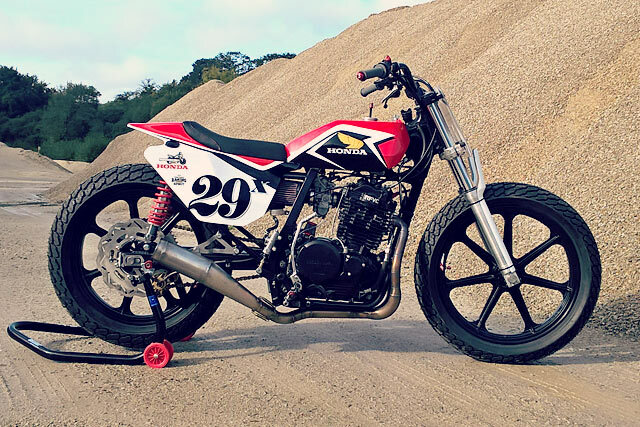 Which is probably why France’s BCKustoms has called this, their gorgeous new ‘87 Honda XLR 600 flat tracker, the ‘Bone Destroyer’.